My father's side of the family has always lived in the east coast. My grandparents spent all of my childhood living in a place called Shad Bay, between Halifax and Peggy's Cove. Some of my fondest childhood memories are of spending a couple of weeks each summer visiting with my grand parents, aunts and uncles (there weren't any cousins really back then) either in Shad Bay or over on the island in Stanhope, just outside of Charlottetown. I can vividly remember so many things about those times. Some of my favourite memories are playing in my grandparents backyard with my siblings, going down the road to swim in Shad Bay proper or stopping at the little store for treats along the way, going swimming with my Uncle Brant in the fresh water pond not to far down the road, throwing jelly fish at my sister, going to Peggy's Cove, spending time in Halifax watching buskers or catching a movie (I distinctly remember seeing the Great Outdoors with John Candy) or taking in a basketball game (the Halifax Windjammers of the short lived World Basketball League). 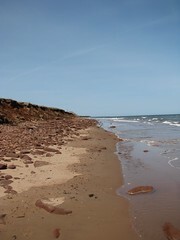 In PEI I can remember going into Charlottetown, enjoying time on Stanhope Beach in Prince Edward Island National Park, trips to Rainbow Valley, messing around on the ride on lawnmower or making homemade ice cream with Harry and Shirley (my Aunt Faye's parents). These were definitely those most idyllic times of childhood. We had a lot of fun, and it was a chance for us to see that side of our family every year. My grandparents eventually followed my Aunt Krista & Uncle Brant and their two children to the island where they were reunited with my Uncle Doug & Aunt Faye, their two boys and Harry and Shirley Lawson. Sadly, my grandparents had begun to have memory issues and have become victims of Alzheimer's. While my Aunts and Uncles had them living just next door, unfortunately their deteriorating mental states necessitated round the clock care. So, last year they were moved into a rest home in Charlottetown where they receive all the assistance they require. Life there isn't so bad as multiple members of my family stop in nearly daily. Meg and I were able to go see them while we were there, and I must say it was a bit difficult for me as it appeared my Nana didn't really remember who I was most of the time. It is difficult to tell if my granddad did as he's a bit more quiet, but I agree with my Uncle Doug that it seemed so most of the time when you watched his face. Even more heart breaking is that they have a tough time remembering my father, but I suppose he has been absent from this world for nearly 27 years. Alzheimer's is definitely a sad condition. I haven't spent a lot of time, if any, with people suffering from it and it certainly seems weird. I mean, my Nana seems from most appearances to be her jovial self, the women I remember throughout most of my life - strong willed, loud and always up for a good time. But she now has trouble selecting words to put together into sentences, as her mind simply fails her, she puts on her best face about it all though. Granddad seems to have a bit better memory, but, he's lived a tough life healthwise with a bout of Non-Hodgkins Lymphoma, a broken leg and most recently a broken hip. I do deeply appreciate the work that Krista, Brant, Faye, Doug and their children have had to do to during these last few years to take care of them. It is undoubtedly a challenge at times and definitely a weight on the heart and soul to see them this way. On a brighter note, Meg and I did enjoy meeting with them, and there were moments where they seemed to recall me and my family. One time that comes to mind is when my Nana asked if I could remember of the name of the fellow that ran that little store on the way down to the bay. I couldn't quite, but my Uncle reminded me that it was Norwood who did so (I have no idea if that was his first or last name). The part that was heartening is that while my cousins probably did get there at some point, I would think that my Nana would most closely associate those trips with my brother, sister and I. Of course we didn't spend the entire weekend visiting my grandparents. We were given the use of my grandparent's old car and so had the run of the island. We took some time to explore Charlottetown which was nice, but certainly different than most of my memories. The reason being that my memories are all from prime tourist times and mid-May is definitely not the same. :) A lot of things don't really gear up until mid-June. All the same we had a good time, bought some stuff at the Paderno outlet, enjoyed a stroll around and some Cow's ice cream and had a beer and nachos at a local brew pub. We took a drive over to Cavendish and went for a nice hike in some pretty high wind and mist/rain conditions and of course took the obligatory stroll on Stanhope Beach in the park (which wasn't yet open so no fee required :D ). My aunt and uncle's treated us exceptionally, serving up fresh lobster at one meal and tonne of mussels at another, so we definitely got our seafood fix. Meg hadn't had a lot of contact with mussels, but I think I've got her convinced at how good they are now. Submitted by Jules (not verified) on Tue, 2009-07-28 21:11. You know you have a place to stay if you want to make a stop in Fredericton and possibly take in the Farmers' Market. Just let us know - the B&B is open for business! Submitted by Jenn (not verified) on Mon, 2009-08-03 20:19. I remember Norwood! I swear we ate a ton of junk food just from his store alone :) Pop, chips, candy. I am glad you had a chance to go see them. We really wanted to but timewise it didn`t work out. Submitted by kevin@haggaret.com on Thu, 2009-08-06 09:29. ...if I ever actually saw you when I was a kid. As you know, we used to go to PEI every summer for a couple of weeks and stayed in Stanhope. I'm sure we visited Stanhope beach on more than one occasion, although most of the time we just went to the beach right across the road from Windermere Cottages - but it's all really one beach. I remember the dunes being much bigger in those days. Who knows if we were ever there at the same time.